China’s military power remains limited and its leaders want no war with the United States, but its desire for regional hegemony, global reach, and advanced technology means the U.S. military has much more to watch out for in the years ahead, according to a new unclassified assessment by the Pentagon’s intelligence agency. DIA’s findings and conclusions will be unsurprising to China watchers, but the assessment also publicly reveals the agency’s top concerns about Beijing’s military plans, leaders, and weapons — a list of concerns intended to guide the Trump administration and military leaders. But Taylor and the DIA seem more focused on how the PLA is helping Beijing attain its grand strategy goals. The Communist Party’s long-stated plan is to seize what they see as a moment of strategic opportunity to help achieve “great power status” that is “designed to enable China to impose its will in the region and beyond,” he said. DIA leaders do not believe that China is there yet. But President Xi Jinping has ordered the PLA to get better at using its rapidly modernizing arsenal, and a senior defense intelligence official who briefed reporters Tuesday said that the Pentagon is closely watching as Chinese leaders extend and gain confidence in their abilities — for example, to strike Taiwan or beyond. DIA believes that China will look to expand from its new South China Sea islands and its new base in Djibouti. China’s most likely conflict may still be with Taiwan, but DIA feels any such fight remains far off. The PLA continues to add missiles that can hit the breakaway island — and U.S. military assets on Guam — but DIA does not believe China’s leaders feel they have the other resources — helicopters, ground forces, etc. — that could win and hold the territory. But DIA worries those leaders may soon grow bolder. Yet one factor will continue to rein in Beijing’s ambitions: experience. China has not fought a war in four decades; moreover, there is a generational gap between newer Chinese military officers, who are being trained for joint warfare across military service branches, and older officers whose have limited experience extends only to their own service branches and regional assignments inside China. Moreover, DIA believes that China’s leaders see their top threats as coming from internal challenges to the party rule, not outside conflict. 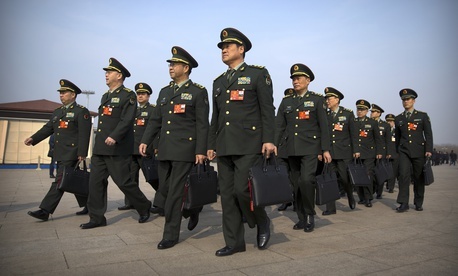 “Beijing’s primary threat perceptions include sovereignty and domestic security issues that it believes could undermine the overriding strategic objective to perpetuate communist rule,” the official said. To put a finer point on it, minority groups and terrorism are not uppermost on the mind of Xi’s government, despite the headlines about the oppressed Muslim population of Uighurs. Rather, they worry about the overall economy of the billion-plus people they rule. “The real biggest threat that worries the Chinese leadership is instability among the majority Han population, because that will become the threat potentially to a regime's instability,” the official said. But if suppressing dissent is the top priority of China’s leaders, it is not the only one. “We have to remember that the Chinese leadership is very focused on domestic stability concerns, but also that we are seeing a developing and a modernizing military that is able to do things much further from internal security that they had focused on in the past,” the official said.